A grand jury in Kentucky has charged nine members of a supposed “criminal syndicate” over what authorities say was a years-long scheme involving the heist of over $100,000 worth of bourbon whisky. According to indictments unsealed on Tuesday in Franklin County, an employee of Wild Turkey and workers from the Buffalo Trace Distillery, were among a group of nine that allegedly made its money by stealing liquor and re-selling it illegally.The New York Daily Newsreportedthat the stolen bourbon that was recovered might soon have to be destroyed. At least 17 barrels of bourbon, 20 cases of Pappy Van Winkle and one stainless steel barrel of Eagle Rare were stolen by the group and later recovered by officials, authorities said, with the latter being worth upwards of $12,000. A Lexington, KY NBC News affiliate reported that the stolen bottles of Pappy, a world-renowned bourbon, were being sold by the group at a price of $800 apiece. Authorities say that Gilbert “Toby” Curtsinger acted as the ringleader of the operation and have charged him with a total of nine counts, including two of receiving stolen property. Curtsinger is alleged to have handled at least $20,000 worth of stolen bourbon from the two distilleries that the group then sold illegally. 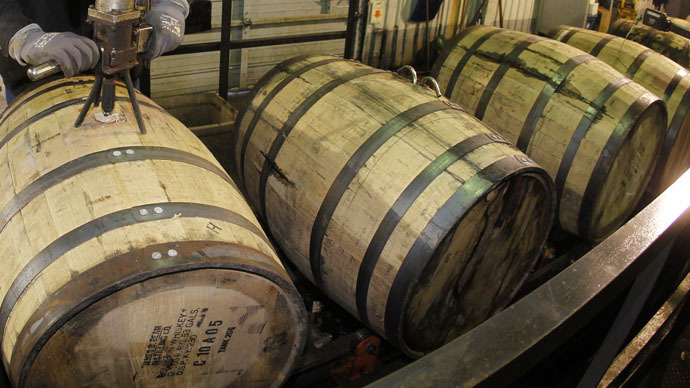 The stolen bourbon had a total value of $100,000. Curtsinger worked at the Buffalo Trace Distillery along his wife and father-in-law, according to the Courier Journal, who were also both named as defendants this week. With the help of the eight others, authorities say Curtsinger conspired to illegally traffic the stolen spirits, as well as anabolic steroids. Officials believe the syndicate began operating as far back as 2008. “When it comes to us, we were able to determine that there was a certain, very large amount of Pappy Van Winkle stolen by members of this syndicate, by Mr. Curtsinger and then thereafter sold to various individuals,” Assistant Commonwealth's Attorney Zachary Becker said at a press conference on Tuesday, the Courier Journal reported. Also indicted this week with engaging in organized crime, a Class B felony, are Julie Curtsinger, Mark Searcy, Ronnie Lee Hubbard, Dusty Adkins, Christopher Preston, Joshua Preston, Robert McKinney and Shawn Ballard. The Preston’s were also charged on Tuesday with four drug counts between the two of them, according to the indictments. "Many, many hours of work has gone into this case," Franklin County Sheriff Pat Melton told reporters upon announcing the charges during a press conference on Tuesday, according to WKYT News. Jack Conway, the attorney general of Kentucky, said in a statement that authorities narrowed in on the crime ring after Sheriff Melton spoke up while in the midst of a conducting a separate steroid investigation. Franklin County had executed search warrants pursuant to that probe and seized cell phones and a hard drive that were then handed off to Conway to give to a state cyber unit. Digital and computer forensic evidence gave prosecutors enough details to present their case to the grand jury that returned Tuesday’s indictment. “We were able to link up a network of individuals who were involved in this crime, and as far as we can tell the crime keeps growing tentacles,” Conway said.